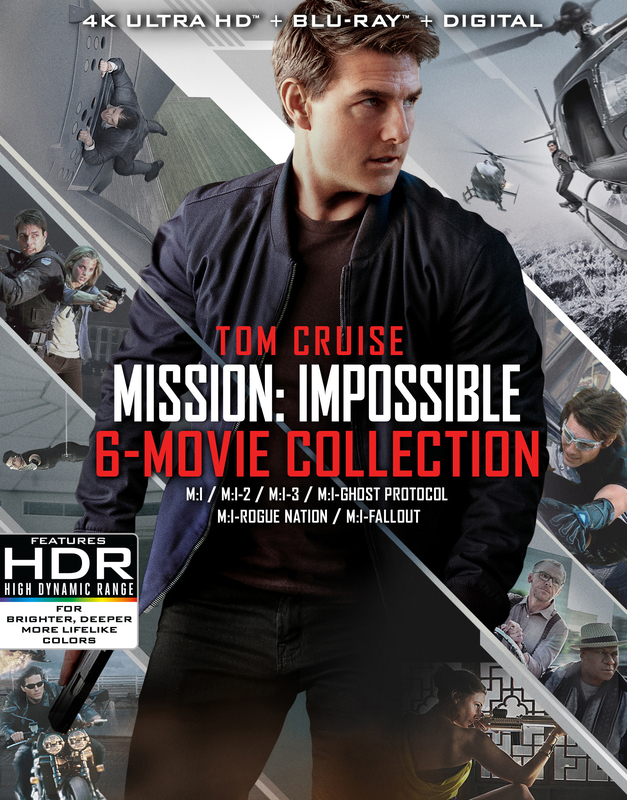 All 6 Mission Impossible movies in 1 pack. Mission: Impossible is a series of American action films based on the television series of the same name. The series is co-produced by and stars Tom Cruise as Ethan Hunt, an agent of the Impossible Missions Force (IMF). Beginning in 1996, the films follow the missions of the IMF's main field team under the leadership of Hunt, who is forced to take over after the team is betrayed from within during the first film. The series focuses on Hunt as the lead character. Ethan Hunt is framed for the murder of his IMF team during a botched mission in Prague and accused of selling government secrets to an arms dealer known only as "Max". On the run, Ethan seeks to uncover the real traitor and clear his name. The film was directed by Brian De Palma. Ethan sends international thief Nyah Nordoff-Hall (Thandie Newton) undercover to stop rogue IMF agent, and Nyah's former lover, Sean Ambrose (Dougray Scott) from stealing a deadly virus to start a pandemic and sell the antidote to the highest bidder. The film was directed by John Woo. Ethan, retired from being an IMF team leader and engaged to be married, assembles a team to face the elusive arms and information broker Owen Davian (Philip Seymour Hoffman) who intends to sell a mysterious dangerous object known as "The Rabbit's Foot". The film was directed by J.J. Abrams. Ethan and the entire IMF are blamed for the bombing of the Kremlin while investigating an individual known only as "Cobalt" (Michael Nyqvist). He and three other agents are left to stop him from starting a global nuclear war. The film was directed by Brad Bird. Ethan Hunt comes under threat from the Syndicate, a near-mythical organization of rogue agents who kill to order. Faced with the IMF's disbandment, Hunt assembles his team for their mission to prove the Syndicate's existence and bring the organization down by any means necessary. The film was directed by Christopher McQuarrie. When an IMF mission ends badly, the world is faced with dire consequences. As Ethan Hunt takes it upon himself to fulfill his original briefing, the CIA begins to question his loyalty and his motives. The film was written and directed by Christopher McQuarrie.